Afghanistan, a country that is more than 99 percent Muslim, has been embroiled in one war or another since the late-1970s. Two byproducts of the violence and economic disarray are a landscape that is littered with landmines, and a struggling healthcare system that has allowed polio — a disease that has pretty much been wiped out in all but three countries in the world — to exist as a real threat. As a result, there are a lot of innocent victims in Afghanistan: victims of war, victims of disease, victims of a life that many people born and raised in privilege couldn’t even comprehend. 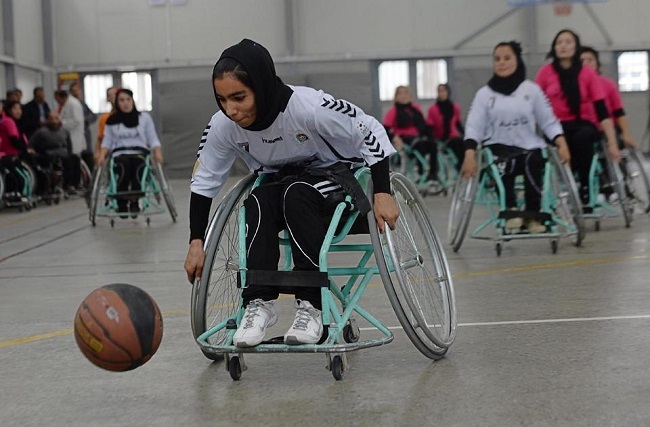 They have lost limbs to landmines and been disabled by mortar shrapnel, but Afghanistan’s wheelchair women basketball players refuse to call themselves victims. Clashing wheelchairs, hooting supporters and balls swishing through hoops brought a drab grey court in downtown Kabul alive Wednesday, in the final of the country’s third annual competition organised by the International Committee of the Red Cross (ICRC). At the end of the forty minutes of play, the scoreline read Mazar-i-Sharif 26, Kabul 9 — but for many of the athletes who took part it was also a personal triumph over years of adversity. Mariam Samimi, a member of the winning side, was just six when she stepped on undetonated ordnance in her native northern province of Balkh, blowing off her toes. It was 1996 and the height of Afghanistan’s civil war, when prosthetics and good medical treatment were in short supply. Now a trained social worker as well as a competitive athlete, the 23-year-old said she wanted others to know that a disability does not mean having to give up on your dreams. “Don’t be disheartened, always have courage, and do not say I can’t do it. Be confident all the time, don’t feel that you are disabled and (that) I should be at home,” she said. It may sound corny if you’ve been burned out on too many dramatic “SportsCenter” features made with Emmy Awards in mind, but stories like these really are why many people get into the sports journalism business. Covering superstars who compete in their chosen sport at the highest level is great, but the best stories to tell are those in which sports play a role in improving someone’s quality of life or brightening their experience. They are the stories that can show us some of the best of what humans have to offer in terms of resolve and determination.